Nestled in the northwestern part of the English Lake District, Derwentwater is one of the principal bodies of water that characterize the region. It is most famous for the viewpoint from Friar’s Crag promontory (described by John Ruskin as “one of the three most beautiful scenes in Europe”) and the hilly fells of Cat Bells, a picturesque attraction of the Lake District National Park. The lake is circled by an extensive network of trails, including an eight-mile (13-km) long walking trail, which is popular with both locals in need of a good workout and visitors seeking jaw-dropping backdrops. Early mornings treks are well worth the wake-up call, as the lake transforms into a calm, stoic mirror of the mountains that surround it. Photogenic opportunities await! And with such beautiful lakeside scenery comes many marinas, the major ones being in Keswick, Portinscale and Lodore Falls. Boat hire is available from all three villages. The Keswick Launch Company also offers regular 50-minute cruises around Derwentwater with seven landing sites located at every corner of the lake. 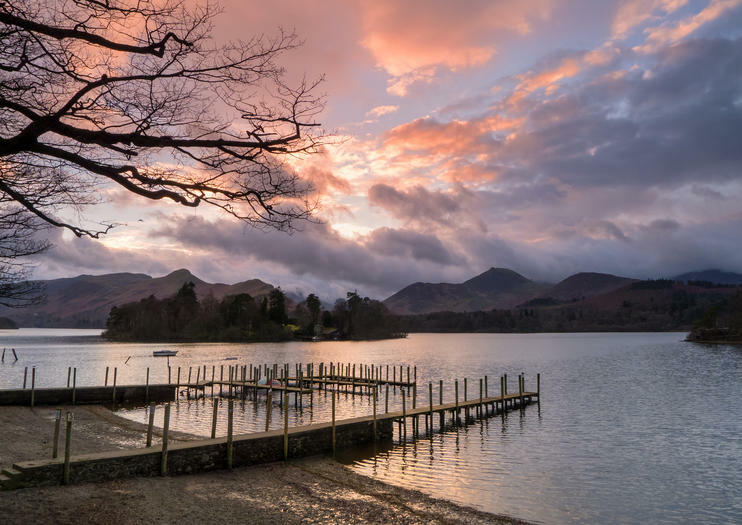 More than just a nautical halt, Keswick is also home to one of Northern England’s most popular theaters, Theatre by the Lake, which features well-known plays lakeside year-round, just five minutes from the town center. Derwentwater features three uninhabited islands as well as Derwent Island and its famous Derwent Island House, a privately owned 18th-century manor open to the public five days a year. Derwentwater’s main city, Keswick, is located two hours north of Liverpool and Manchester and can be accessed via the M6 and the A66. It is also reachable from Newcastle via the A69, the M6 and the A66. Experience the rugged beauty of England’s Lake District on 6.5-hour day trip from Windermere. Aboard a comfortable coach, you’ll wind through the picturesque hills, visit charming English villages and take in the majesty of 10 idyllic lakes including Lake Windermere, Rydal Water, Grasmere, Thirlmere and Derwent Water. Spend a day surrounded by unspoiled nature! Step off the beaten track and discover the majesty of rural England’s Lake District region on this full-day lake explorer tour from Windermere. Travel deep into the countryside with your guide and enjoy panoramic views over the Lake District’s mountaintops, waterfalls and lakes. Head away from the crowds on a beautiful lakeside drive through Buttermere and Crummock Water. Take in breathtaking views over Grasmere and enjoy an optional cruise onto magnificent Lake Windermere. During your tour. visit local tea rooms to sample delicacies such as gingerbread, scones and cakes. Succumb to the beauty of England’s Lake District National Park on this 3-day experience including accommodation, free time and a full-day tour. Spend two nights at the 4-star Lindeth Howe hotel — a house once owned by Beatrix Potter — and enjoy time to absorb the Lake Windermere views and perhaps explore nearby Bowness-on-Windermere. Plus, enjoy a guided day trip around the region’s highlights. Traveling by comfortable minivan, see ten lakes including Buttermere and Grasmere, cross high passes, visit Keswick and more. Round-trip hotel transfers and daily breakfast and dinner are included on this small-group experience limited to 16 people. Rolling hills, peaceful lakes and sleepy villages await you on this private, full-day of the Lake District from Windermere. Traveling in a private vehicle driven by a professional driver-guide, you’ll journey through the beautiful English countryside in search of the region’s prettiest lakes. See Windermere, Buttermere Valley and Ullswater Lake; travel along some of the country’s highest mountain passes; and visit either Grasmere village or the market town of Keswick. Discover multiple lakes, mountain passes, villages, and scenic viewpoints with a full-day itinerary that takes you around the Lakes District. Among the gems you’ll visit Lake Windermere, Brothers Water, Grasmere, and Rydal Water, and enjoy a 1-hour cruise on Ullswater. Throughout the tour a guide provides information on each destination, with a separate driver to maximize safety during transport. Our Private Hire Ten Lakes Spectacular Tour is the perfect opportunity for small groups of friends or family to enjoy their very own Private Tour. Our luxury, spacious 6 seater minibuses will allow you to travel the central Lake District in style. The Lake District serves up glassy lakes, mountains, and historical sites—all fairly widely dispersed. Cover many of its must-sees in a day without self-drive on this private tour. With a driver-guide, you’re free to admire and learn about the sights undistracted by driving or planning. Visit Derwentwater and Grasmere; and explore Castlerigg Stone Circle and more; all topped and tailed with pickup and drop-off at Lakes or north-west hotels.